SaaS solution for remote monitoring and management of systems. 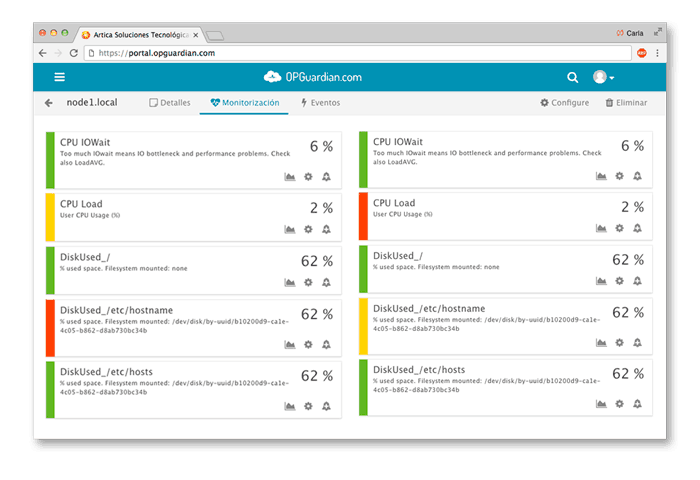 OPGuardian is a SaaS solution for remote monitoring and management of systems, accessible from any location with Internet connection and without having to install any software. Why do I need OPGuardian? Designed by Pandora FMS and eHorus developers. 100% SaaS application, developed from scratch. You only pay for what you actually use. Monthly payment. Lower TCO compared to other solutions. For Windows, Mac, Linux and Unix. For Linux, Windows and Mac. You’ll be able to collect all the pieces with the monitoring information. WEB, DNS, latency and much more for your servers in the cloud. By email, SMS and Telegram. Do you want further information about OPGuardian?